Despite its important role in the early years of the Civil War, the Army of the Ohio remains one of the least studied of all Union commands. With All for the Regiment, Gerald Prokopowicz deftly fills this surprising gap. He offers an engaging history of the army from its formation in 1861 to its costly triumph at Shiloh and its failure at Perryville in 1862. Prokopowicz shows how the amateur soldiers who formed the Army of the Ohio organized themselves into individual regiments of remarkable strength and cohesion. Successive commanders Robert Anderson, William T. Sherman, and Don Carlos Buell all failed to integrate those regiments into an effective organization, however. The result was a decentralized and elastic army that was easily disrupted and difficult to command--but also nearly impossible to destroy in combat. Exploring the army's behavior at minor engagements such as Rowlett's Station and Logan's Cross Roads, as well as major battles such as Shiloh and Perryville, Prokopowicz reveals how its regiment-oriented culture prevented the army from experiencing decisive results--either complete victory or catastrophic defeat--on the battlefield. 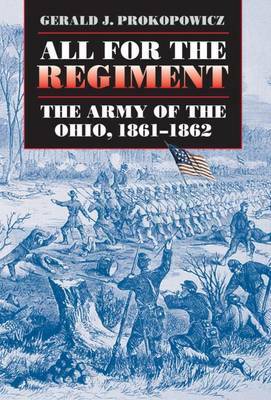 Regimental solidarity was at once the Army of the Ohio's greatest strength, he argues, and its most dangerous vulnerability.